Several mayors have criticized public comments from the U.S. Immigration and Customs Enforcement (ICE) acting director that denounced so-called “sanctuary cities” and called for heavy enforcement of immigration rules. In a Jan. 2 interview with Fox News’ Neil Cavuto, ICE Acting Director Thomas Homan criticized sanctuary cities and their immigration enforcement-related policies, according to the Dallas Morning News. "For these sanctuary cities that knowingly shield and harbor an illegal alien in their jail and don't allow us access, that is, in my opinion, a violation of 8-USC-1324. 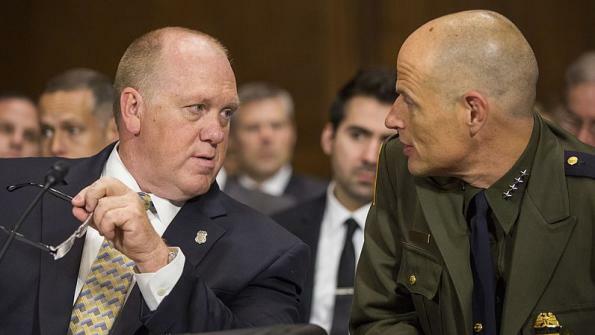 That's an alien smuggling statute," Homan said, adding that his agency would “enforce the law without apology,” per the Morning News. Homan also called for legal action to be taken towards mayors of such cities. "We got to take these sanctuary cities on. We got to take them to court. And we got to start charging some of these politicians with crimes,” he said. Many local leaders, including Austin, Texas, Mayor Steve Adler, have since criticized Homan’s comments and have stood firm in their local policies on immigration. "I will oppose anti-immigrant policies, regardless of the personal consequences, because spreading fear and making threats makes us less safe,” Adler said in a statement, per Spectrum News. Sacramento, Calif. Mayor Darrell Steinberg was more general in his response. “As I’ve always said, there’s only one way to deal with bullies, and that is to stand your ground and stand with the people, and that’s what we’ll continue to do in Sacramento,” Steinberg said, adding that the city would “redouble our efforts” to protect immigrants, according to the Sacramento Bee. Several of these mayors have not taken hardline stances on cooperation with federal immigration authorities yet still criticized Homan’s threats. “In Denver, we stand firmly for the ideals of inclusion, acceptance and opportunity, and no threat will ever make us waver from that,” Denver Mayor Michael Hancock’s office told the Post. Denver has no specific “sanctuary city” laws, but Denver officials don’t enforce certain immigration laws, according to the Denver Post. Dallas Mayor Mike Rawlings denied his city being a sanctuary city and said that Dallas cooperates with ICE. However, he and said he had “zero fear” of being arrested, the Morning News reports. Sanctuary cities, which have no legal designation, generally refer to cities with varying limits on law enforcement cooperation with federal immigration authorities, according to Fox News.